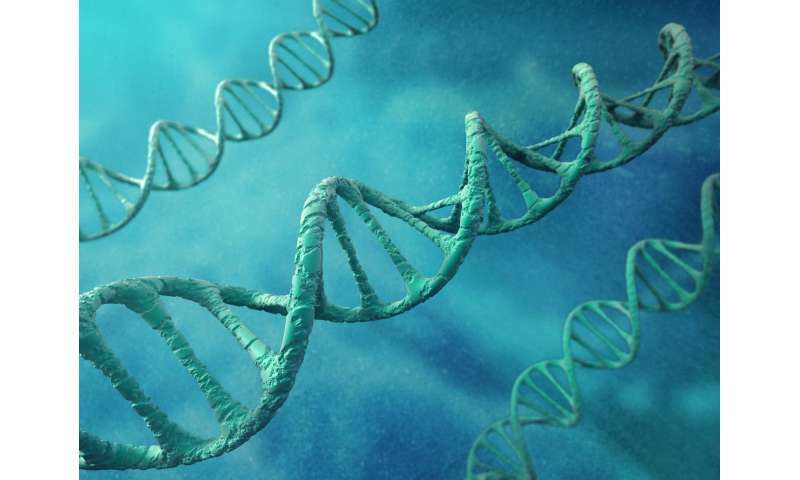 Researchers at Delft University of Technology, in collaboration with colleagues at the Autonomous University of Madrid, have created an artificial DNA blueprint for the replication of DNA in a cell-like structure. Creating such a complex biological module is an important step towards an even more ambitious goal: building a complete and functioning synthetic cell from the bottom up. Copying DNA is an essential function of living cells. It allows for cell division and propagation of genetic information to the offspring. The mechanism underlying DNA replication consists of three important steps. First, DNA is transcribed into messenger RNA. Messenger RNA is then translated into proteins—the workhorses of the cell that carry out many of its vital functions. The job of some of these proteins, finally, is to perform the last step in the cycle: the replication (or copying) of DNA. After a cell has replicated its DNA, it can divide into two daughter cells, each containing a copy of the original genetic material. Researchers had already realized all of the separate steps mentioned above. Japanese scientists, for instance, created a minimal, stand-alone system for messenger RNA and protein synthesis by taking the relevant components from E. coli and tweaking them. But no one had yet been able to combine this system with autonomous DNA replication. "We wanted to close the cycle and be the first to reconstruct the entire flow of genetic information inside a cell-like structure called a liposome," said group leader Christophe Danelon. Combining the Japanese system with a module for DNA replication proved difficult. "We tried a few approaches, but none seemed to work convincingly," said Danelon. Then, Ph.D. student Pauline van Nies came up with the idea to use the DNA replication machinery of a virus called Φ29. "Viruses are very intriguing from a molecular biology point of view," said Van Nies. "They are extremely efficient in encoding proteins in a small genome and in robustly replicating their genetic information." In human cells, DNA replication is managed by hundreds of proteins. Φ29 only needs four. Many years ago, researchers working at the Autonomous University of Madrid discovered the DNA replication mechanism of the Φ29 virus and managed to isolate it. Van Nies and Danelon worked with these researchers to combine the genes that encode for the replication mechanism with the genetic code that is necessary to operate the Japanese module for transcription and translation. Van Nies composed a unique DNA blueprint that took into account a number of different factors related to the flow of genetic information, such as a suitable binding site for the ribosome, an element that is essential for the production of proteins. A goal that now comes into view is combining the new module that regulates the flow of genetic information with other essential cellular functions such as growth and division. Last year, the Danelon group created a way to synthesize the phospholipids that make up liposomes, such as the ones the researchers used in this project. The yield of phospholipids was still too small to sustain growth, but Danelon is confident his group can optimize this process. Cell division may be a tougher nut to crack. In modern cells, it requires a streamlined process in which copied DNA is neatly packed and then evenly distributed towards the poles of the cell. Concurrently, specialized proteins squeeze the mother cell into two daughter cells. Danelon thinks a simple 'budding' mechanism could also do the trick. "I think we can create liposomes that grow until they start budding. If enough DNA is being produced, hopefully enough of these primitive daughter cells will contain the new DNA to sustain a cell population." This may well be how the very first cells self-reproduced, before evolution equipped them with a more elegant and robust solution. The mission that ties together all of the fundamental research described above is the construction of a synthetic cell that can grow, divide and sustain itself. Scientists at Delft University of Technology play a leading role in this exciting new research direction that may ultimately lead to intimate understanding of the inner workings of a cell. Research supporting the initiative could lead to advances in biotechnology, health and energy.